Phenylethylamine is a stimulating compound found in a number of food sources and produced naturally in our bodies. Phenylethylamine (PEA) helps to boost your mood, energy, and focus. When people talk about the ‘runner’s high’ they’re often talking about PEA. Phenylethylamine is broken down very rapidly by enzymes and its effects only last for around 1-2 hours. Taking PEA with some MAO-B substrates like Hordenine helps to prolong the effects for a few more hours. Phenylethylamine is a stimulant but is considered safe because of how quickly its broken down. The common PEA dosage is around 500 – 1500 mg daily. Firstly, Phenylethylamine is a strong stimulant. It influences receptors in your brain that respond to ‘energizing’ hormones. So, PEA makes your brain more responsive to hormones like epinephrine and norepinephrine. We call these the fight-or-flight hormones – ancient hormones found in all animals that make you much more energized. Secondly, PEA creates a feeling called the ‘runner’s high’. It’s found in dark chocolate and red wine and your body creates lots of it after exercising. PEA binds to receptors called trace amine receptors. These are the same receptors that many psychedelics bind to. Thirdly, phenylethylamine increases serotonin and dopamine, the ‘feel-good’ hormones. The effect is a powerful mood boost! Lastly, phenylethylamine is great at improving focus and concentration. This is great for people with ADD or who need a little more focus. It’s also good for older people. As we get older, the number of brain chemicals called catecholamines reduces, causing lower energy and mood. PEA helps to increase catecholamines and restore mood and energy. Your brain metabolizes (breaks down) Phenylethylamine very quickly. So, the effects only last for around 1-2 hours. PEA is broken down by enzymes called MAOs. If you take PEA along with natural MAO inhibitors the effects are able to last for much longer. MAO-A inhibitors can be dangerous when you combine them with stimulants. There aren’t many studies into the best dosages of phenylethylamine. Since it is produced in our bodies naturally and broken down very rapidly, it’s quite hard to conduct studies on PEA supplements. Animal tests using Phenylethylamine dosages of between 1 – 40 mg/kg bodyweight showed positive effects. The receptors that PEA effects work slightly differently in animals than in humans. Most users opt for a Phenylethylamine dosage of around 100 – 500 mg once to three times daily. Phenylethylamine is a strong stimulant. Side effects of stimulants include irritability and restlessness. It can also cause increased heart rate. Taking PEA with MAO inhibitors prolong the effects and may increase its side effects. If you want to increase the length of the PEA experience, you’d be better off taking PEA with Hordenine. Hordenine is an MAO-B substrate, which is safer than taking MAO inhibitors. 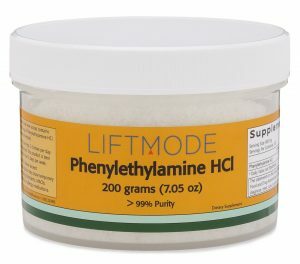 Phenylethylamine is a powerful but natural stimulant. You’ll get an increase in energy and focus as well as a major mood boost. Phenylethylamine on its own is a fast-paced substance. You can prolong the effects of this wonderful energizing compound by including Hordenine in your stack.